green. in august. 'tain't right. Last night the kind folks at South Wind took in five refugees from the flooding. 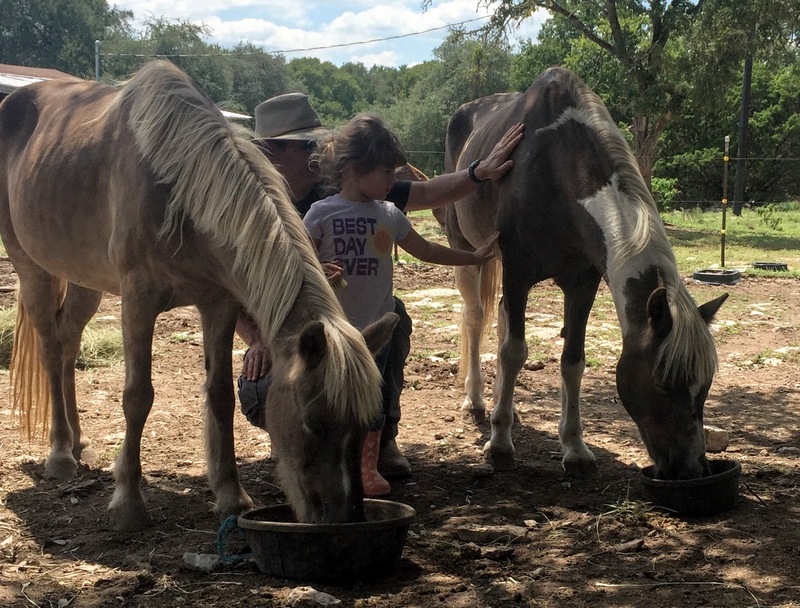 The ponies and the dark bay are Bluebonnet horses but the paint and the gray are probably the foster family's personal horses. They're all super friendly. Hot Shot was lame this morning. 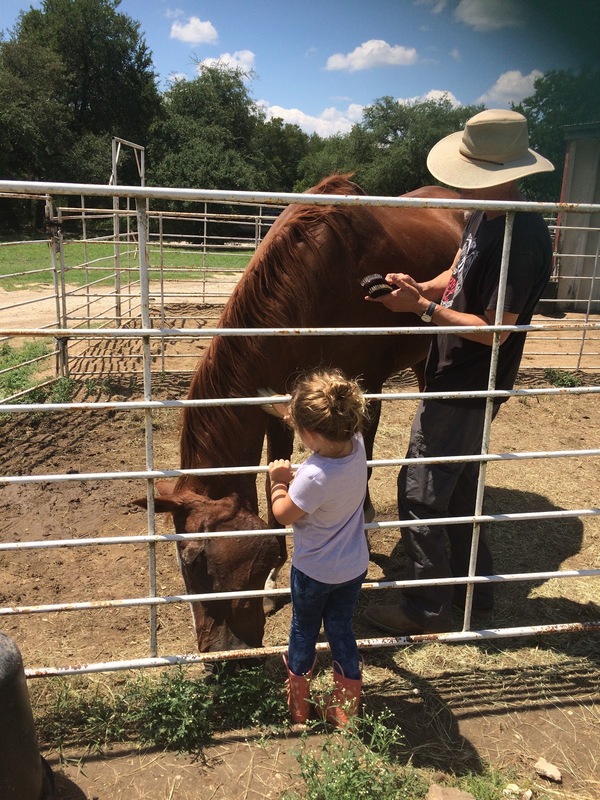 He wouldn't move or eat, scary - we thought he might have torn something but it turned out he had an abscessed hoof, which should be treatable. Thank gosh it wasn't something more serious. Check this out: How horses got their hooves (NY Times). Timely! More than a horseman, Tom Dorrance, a most extraordinary horseman, Part I, Tom Dorrance, a most extraordinary horseman, Part II. We had a blustery dry band at noon so Ondine and I walked to the park. She was as supercharged as the atmosphere - loved it. Sunny, the pretty palomino mare, just arrived, and there are a couple more gelding boarders on the way - full house at the ranch! Hot Shot seems to be doing better - he still has a little swelling around his hind fetlocks but he's not limping. It was raining when I left the house but dry at the ranch, and it turned into a really nice morning - got to chat with Kelly while the Natural Lifesmanship folks were doing some videography in one of the round pens. Those guys are doing some real cutting-edge connection/relationship work - I might have to look into taking their "fundamentals" course. Glad I had a chance to get out today in case Saturday is wet; sounds like the coast might be in for a beating this weekend. It was fun to see everyone all excited. Hot Shot fetched up lame this morning so we did some care-taking - a cold water soak and a bath, then some quiet grazing while he dried. The Guardian's caption for this painting, Kōnosu Station by Eisen, says that "the traveller on the left is a mendicant monk wearing a tengai – a conical straw hat that obscured the wearer’s identity and symbolised detachment from a worldly life." I gotta get me one of those. Oh, this is great - check out this visualization (Dressage Today). Lessons from a Victorian-era cat dictionary (Atlas Obscura). April's a Time Lord! Scientists hope to breed Asian 'unicorn' (The Guardian).